What could be better than designing your own amp? With the program's variable interface for amps and cabinets, you can combine components from different amps and speakers. This lets you customize your sound and manipulate it according to your needs. The Vandal bass and guitar amp doesn't try to emulate the sound of some analog amp, but rather sends the plugin signal through its own virtual chain comprising stomp box, amplifier, speaker and microphone - All clean, crunch, hi-gain and lead sounds are formed through amplifiers with emulated output. This gives these amps an honest, clean sound that responds to the skill of the musician and the instrument's sound. The intuitive program interface is based on how professional guitarists and bassists work with tube amps, stomp boxes and other hardware and lets you get started right away. vocalist and founding member of legendary British band "The Mission"
Develop your own sound with customizable pedalboards - whether you're playing metal, funky, jazz or surf guitar. You can add up to four different effects pedals for overdrive, distortion, modulation,delay, echo, or a 7-band EQ. Distorts guitars, basses and everything around it with its heavy sound. It's about to get loud! The cabinet section in Vandal contains a number of virtual speakers in different sizes (10", 12" and 15"), models and materials for guitars and bass. Change the position, distance to amp and the volume of the three microphones (2x dynamic and 1x condenser) to set the optimal sound. We've integrated an additional, comprehensive effects rack at the end of the signal path for those effects that don't always sound good "before" the amp. It's yet another option for adapting the sound to your needs. From the tubes to the speaker coils, every step and component of the amplifier is virtualized and, thanks to the Physical Modeling technology, creates unparalleled great sound – whether for a recording session in a studio, during band rehearsal or for a live performance! 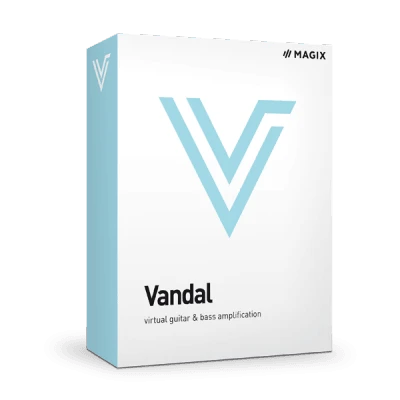 Vandal is available as a VST plug-in.